Special thank you to Blackbeard Sailing Club for use of the facility in support of the Regatta and Jr. Sailing! The Edward Teach Youth Sailing Association welcomes Jr Sailors to participate in the 2018 ETYSA Jr One Design Regatta. 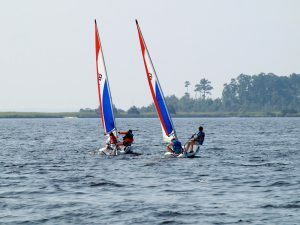 Classes expected to participate include: Optimist, Topaz Uno, Sunfish, and Club 420. Two boats will constitute a class. If other classes would like to participate, please contact the Regatta chair at treasurer@etysa.org prior to July 9, 2018.